Many thanks to Graham Price for sending in the above image of the view from the corner of Deneshey Road, looking toward Hoylake. The post card is dated 1915. 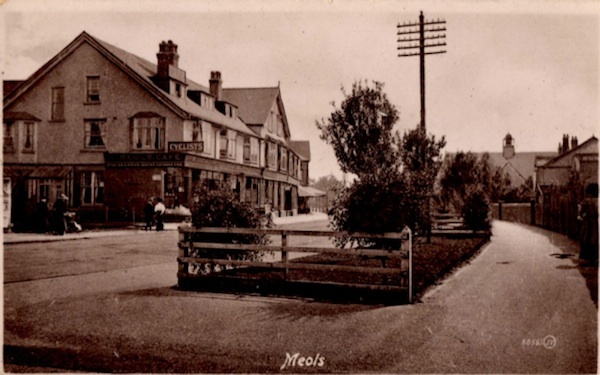 The postcard is titled ‘Meols’ which is possibly questionable? I do know that Deneshey Road is (or was) classed by the Post Office as Great Meols, though Saxon Road (which is off Deneshey) is classed as Hoylake. I know that there’s the (awful, in my opinion) wrought iron Welcome to Hoylake sign before Deneshey Road but I don’t think that can be judged as a boundary marker. 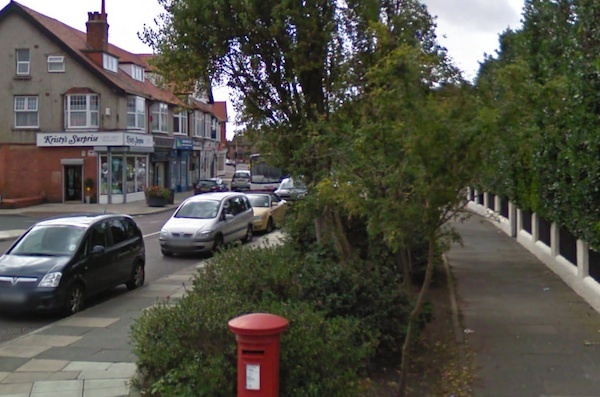 What was that cyclists shop on the corner of Sandringham Avenue? Note that the pillar box and the phone box haven’t yet been installed and you can see the old Hoylake YMCA in the background (RH side). Just out of shot on the left is Carlton Terrace and the site of Burnett’s Garage. And here’s a view from Chapel Road, looking towards to Meols. Ahhh thanks for solving that mystery for me. My son brought me home the above picture , being part of a set of local images being sold at Carr Farm. We were trying to work out where it was, but of course now you say it is crystal clear! We moved to Saxon Road in 1975 and the road-sign was ‘Saxon Road, Great Meols’ unless my (increasingly poor!) memory fails me. The garden, opposite what was Burnett’s garage, looked little different in 1915 compared with 1975. Yes, I remember very clearly that the Saxon Road sign did say Gt. Meols although the Hoylake and Meols boundary signs were then by the telephone exchange so it would have been in Hoylake on that measure. The historical boundary was always said to be Carlton Terrace but which end I know not!! We lived and worked at 28 Birkenhead Road until 1999 – which is just about in the centre of the shot with a range of canopies shown outside. A Gas Board van had demolished the one outside ours in the 1960s. Ours was built in 1907 and traded as CM Wilmott until we took-over in 1983. Always understood Deneshey to be Great Meols but we were definitely Hoylake. I suspect the “Cyclists” shop at the end of Sandringham Av. is actually a cafe – who welcomed cyclists – forerunner to the Eurika Cafe at 2 Mills perhaps!